The Canolfan Gorseinon is conveniently located close to the M4 Motorway. It is a new, iconic building with a selection of seminar, conference, meeting and board rooms for hire, all furnished to the highest specifications. The Centre has free on-site parking spaces for 100 cars and the extra on-site facilities of a healthy eating cafe and childcare facilities if required. State-of-the-art audio visual facilities are available, staging and lectern, with level access to the ground floor and a lift to the first floor facilities. 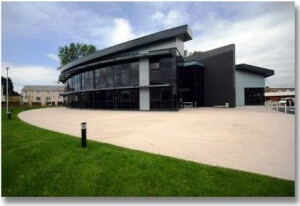 It is an environmentally friendly and sustainable building with under floor heating, natural air conditioning, rain-water harvester tank, biomass boiler, motion sensor and light sensitive lighting, solar panels for hot water and has achieved BREEAM excellence status, only the second building in Wales. Construction materials used in the building are from recycled resources.